Journal of Turkology is the peer-reviewed, international and academic journal. Authors bear responsibility for the content of their published articles. 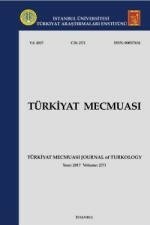 Journal of Turkology, which includes original scientific articles in the field of Turkish Language, Turkish Literature, Turkish History, Turkish Art and Turkish Culture in general, intends to become a source of scientific information by improving visibility and accessibility of qualified information about social sciences. In this context, the journal aspires to contribute to scientific community. Journal of Turkology, which is the publication organ of Research Institute of Turkolgy includes scientific articles in the field of Turkish Language, Turkish Literature, Turkish History, Turkish Art and Turkish Culture in general.